Welcome to the homepage of the South Bay Alumnae chapter of Delta Delta Delta Fraternity. Most of our members live or work in the South Bay area of southern California from El Segundo to San Pedro, including Manhattan Beach, Hermosa Beach, Redondo Beach, Palos Verdes, Hawthorne, and Torrance. Go to our Join page to pay online or download the membership form. Click here to see the latest membership list. All Tri Deltas and NPC members are invited. RSVP to sobaytridelta@gmail.com. This will help us plan seating. 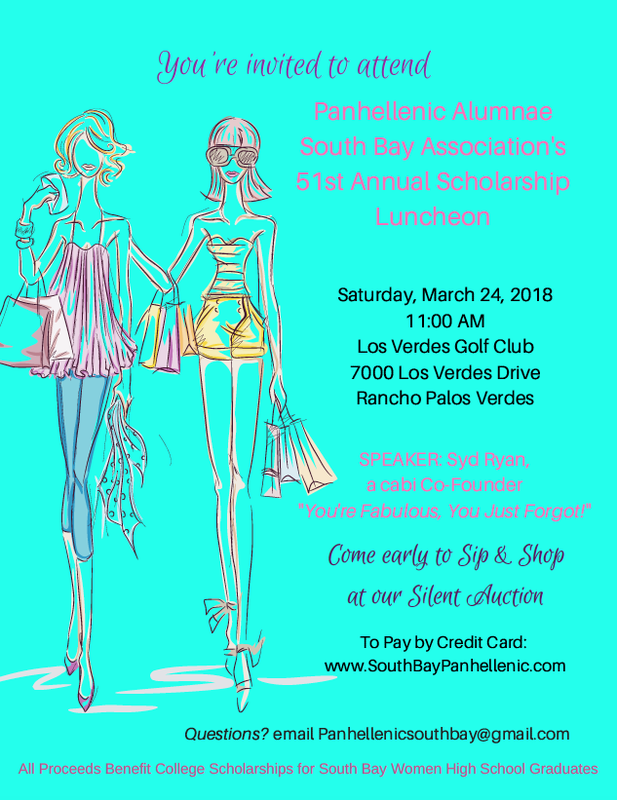 You're invited to the Panhellenic Alumnae South Bay Association's 51st Annual Scholarship Luncheon. All proceeds benefit college scholarships for South Bay women high school graduates. Come early to sip and shop at the silent auction. Speaker: Syd Ryan, a Cabi co-founder, "You're Fabulous, You Just Forgot!" For more information and ticket sales, click here. Tickets for luncheon must be purchased by Fri, Mar 8. Donations and raffle ticket purchases may be made through Mar 24.